For most of his life, Sean Danda has wanted to be a priest. He heard God’s call to the priesthood as early as the second grade at St. Malachy School in Brownsburg, and talked about becoming a priest when he grew up. At Cardinal Ritter Jr./Sr. High School in Indianapolis, his friends and teachers all knew that he wanted to study for the priesthood after graduation. As a sophomore, he won the first-place award in the 10th-grade division of the Indianapolis Serra Club’s vocations essay contest with his insightful description of the priesthood and religious life. Family members, friends and priest mentors agree that Deacon Sean Danda is a compassionate, dedicated, faith-filled and prayerful young man who will enjoy helping people in his priestly ministry. He will be ordained to the priesthood by Archbishop Daniel M. Buechlein on June 27 at SS. Peter and Paul Cathedral in Indianapolis, and the rite of ordination will be the realization of his longtime dream. His Mass of Thanksgiving is at 2:30 p.m. on June 28 at St. Malachy Church, 9833 E. County Road 750 North, in Brownsburg. “I can distinctly remember the first day I met Sean Danda,” Msgr. Joseph F. Schaedel, vicar general, recalled. “It was at St. Malachy on Holy Thursday in 1995. I think he was in the fifth grade. I was the assistant at St. Malachy Parish at the time. He introduced himself and said, ‘I’m Sean Danda, and I’m going to be a priest.’ I thought, at the time, ‘Well, that’s great!’ And he did it. 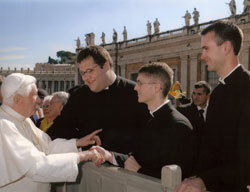 Father Eric Johnson, vocations director for the archdiocese, said Deacon Danda enthusiastically devoted himself to his theology studies at St. John Vianney Seminary in St. Paul, Minn., then at the Pontifical North American College in Rome, where he will return in October to complete a Licentiate in Fundamental Theology. Father Joseph Moriarty, the associate director of spiritual formation at Saint Meinrad School of Theology, served as chaplain at Cardinal Ritter High School and later as archdiocesan vocations director. Deacon Danda’s sister, Heather, also answered God’s call to religious life. She is a postulant in the Society of Our Lady of the Most Holy Trinity in Belcourt, N.D.
Because of serious health complications from systemic scleroderma, a chronic autoimmune disease, Katherine Danda lives with the Little Sisters of the Poor and the elderly residents at the St. Augustine Home for the Aged in Indianapolis. She appreciates the opportunity to go to daily Mass at the St. Augustine Home, and is looking forward to watching her son’s ordination with her husband, Richard, and their daughter at the cathedral. In an e-mail interview from Rome, Deacon Danda said he is “very grateful for my Catholic education, which not only prepared me well academically, but also helped me to integrate the faith in myself and my life. The voice of God often came to me through my teachers and peers. It was just a matter of me listening. “I first started pondering priesthood in second grade during first Holy Communion preparation,” he said. “I could see no better way to serve God and others than by offering the Mass and giving people the Eucharist. Pius is his confirmation name. His priest mentors are Msgr. Schaedel, Father Moriarty, Father Vincent Lampert, Conventual Franciscan Father Troy Overton and Father Wilfred Day.